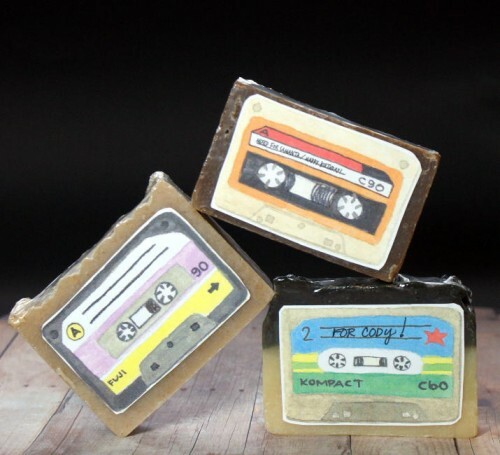 These DIY mix tape soap favors make great party favors, stocking stuffers and even homemade holiday gifts for co-workers or other large groups! While there’s not a concise answer on whether they are mix tapes (mixtape?) 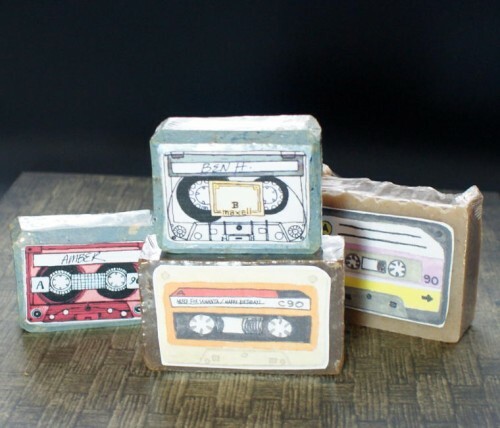 or mixed tapes – I’m not even sure anymore and as a Gen-Xer I grew up on these things – these DIY mix tape soap favors are sure to have their recipients reminiscing over the past. 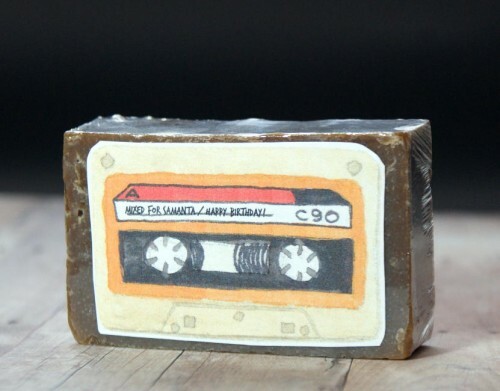 To create the mix tape labels for your soap favors you’ll need to begin by creating a new text document. 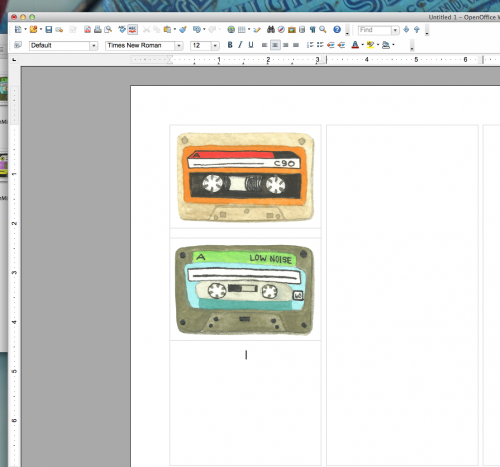 Now format your page by choosing Format > Page. 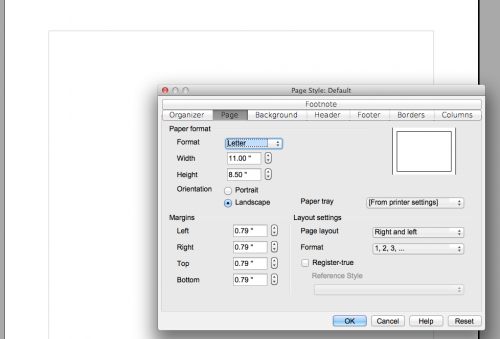 From the pop up box, choose Page, then selection Landscape as the orientation. 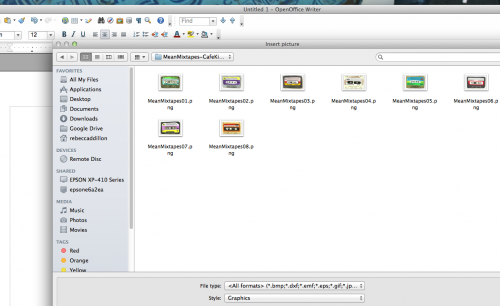 Now format your columns by clicking on Columns. 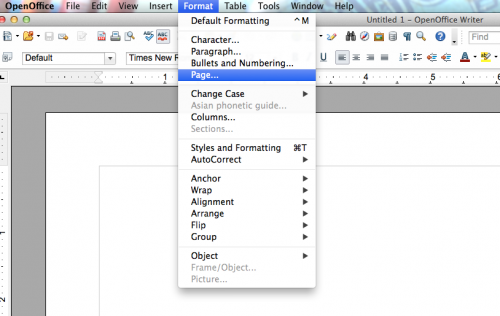 Toggle up to 3 or type in 3 in the box under Columns. Choose the space by toggling up once to 0.10″. Then click OK at the bottom to save your changes. 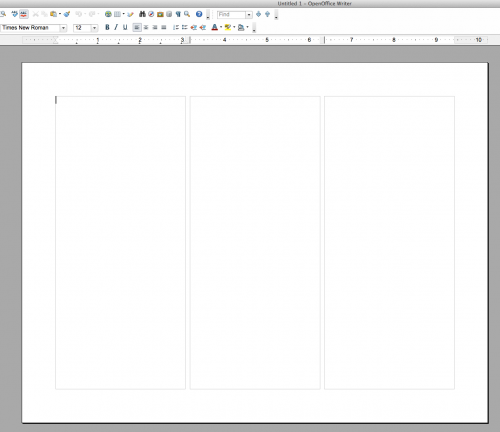 Your blank text document should now look like the screenshot of mine above. 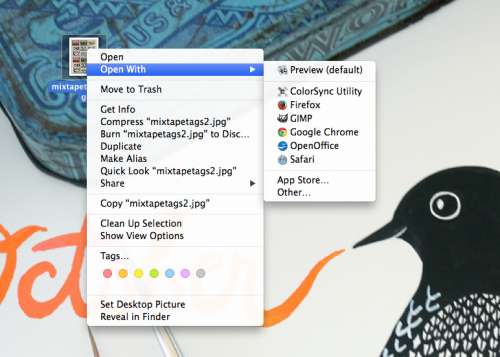 You can now begin to add your mix tape clipart images to the text document. To do this choose Insert > Picture > From File. This will add your first chosen image to the document. 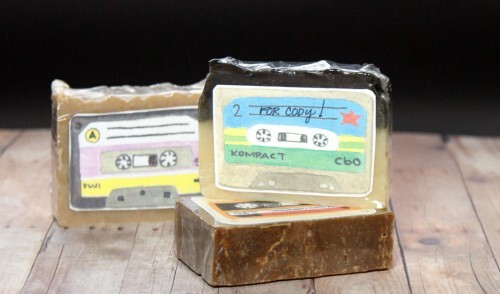 As my bar soaps are all around 3 1/4″ x 2 1/4″ I did not need to re-size my labels to fit the soap. 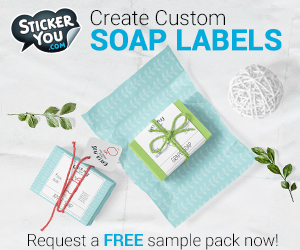 If you need to re-size your labels to fit onto a smaller bar of soap, then you would simply hold down the shift key (to keep the image proportions the same) and left click on your mouse at the same time while holding your mouse arrow on the green box in bottom right hand corner. Move the mouse diagonally toward the next corner until it reaches the desired size. 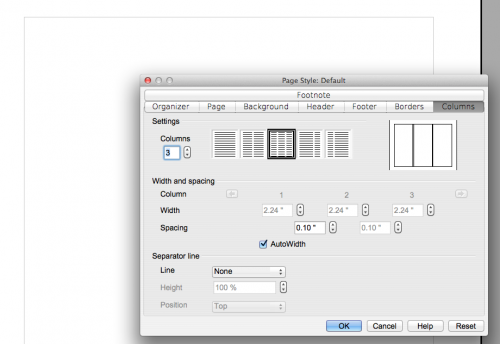 Use the scale at the top of your text document to know when you’re image reaches the desired size. Once you’ve posted the first image, hit the Return key on your keyboard once to apply a space before you post your next image. Now simply repeat the process of adding new images one at a time (re-scaling if needed) until your entire page is full. 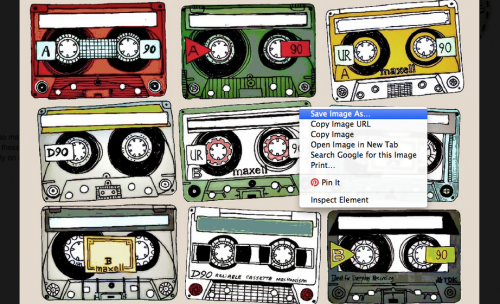 This page format will accommodate nine mix tape images. 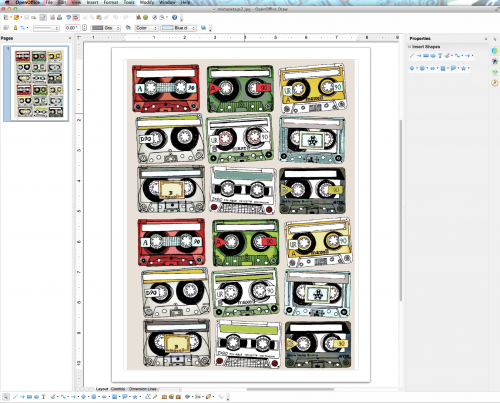 Using scissors, cut out each individual label. If desired, write in a message for your recipient(s). 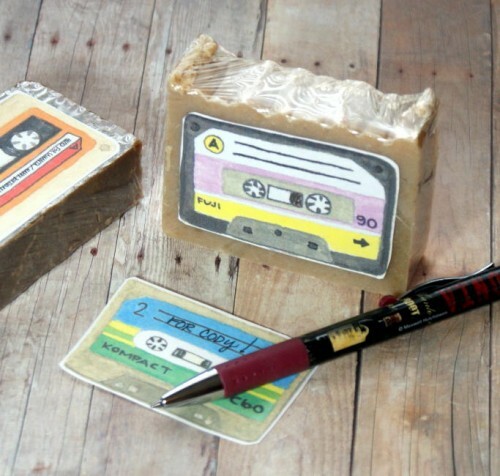 Then remove the sticker paper backing and adhere the DIY mix tape labels to your wrapped soaps. And you’re done! Wasn’t that easy? 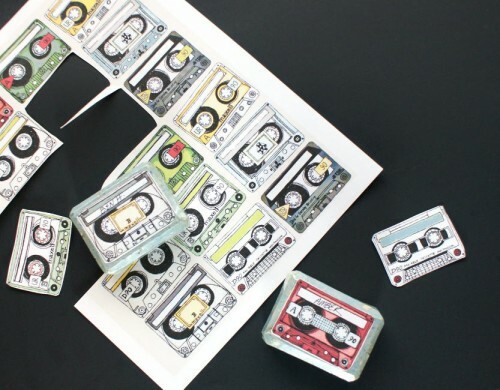 If you are on a super tight budget you can alternately print out this free download of mix tapes from Cart Before the Horse blog. (Re-pin this download here for later.) You won’t be able to resize them as they aren’t individual files without a little bit of work in an image editor such as Gimp (also free!) or Photoshop, but you can print them as is if desired. Left as is, however, they are the perfect size for guest soaps! Simply click on the image at Cart Before the Horse then right click and choose Save Image As… Save the image to your desktop or other location where you can find it easily. 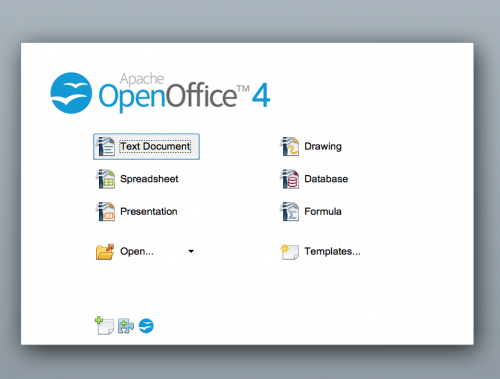 Now right click on the image from it’s location and choose Open With > OpenOffice. 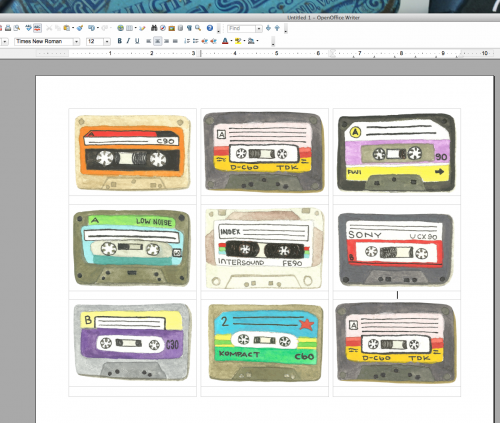 This will open the collection of mix tape images onto a one page document in OpenOffice. 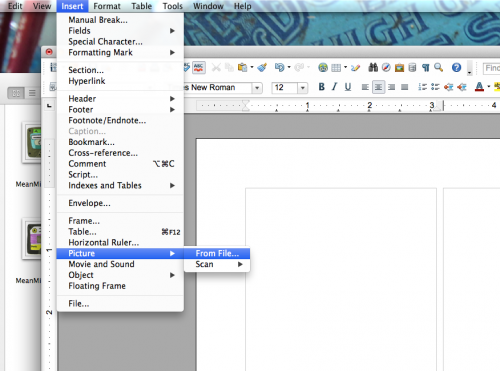 No choose File > Print or CTRL P (windows) or COMMAND P (mac) to bring up your print dialogue box. 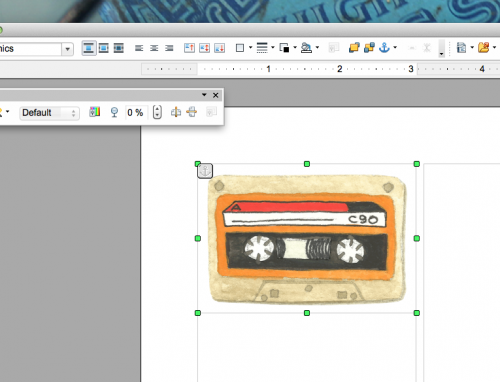 Print your document onto a full sheet sticker label. 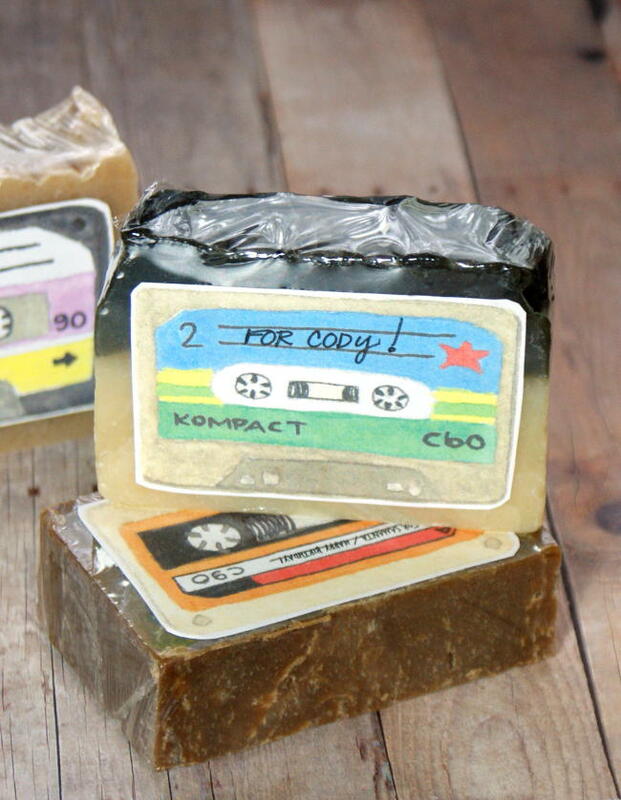 Now cut out your mix tape labels and adhere to the front of your guest sized soap bars. For more printable project ideas be sure to follow my Printables board on Pinterest as well as many of my other Pinterest boards for everything from homemade soap recipes and bath and beauty DIY’s to a slew of DIY projects and crafts. 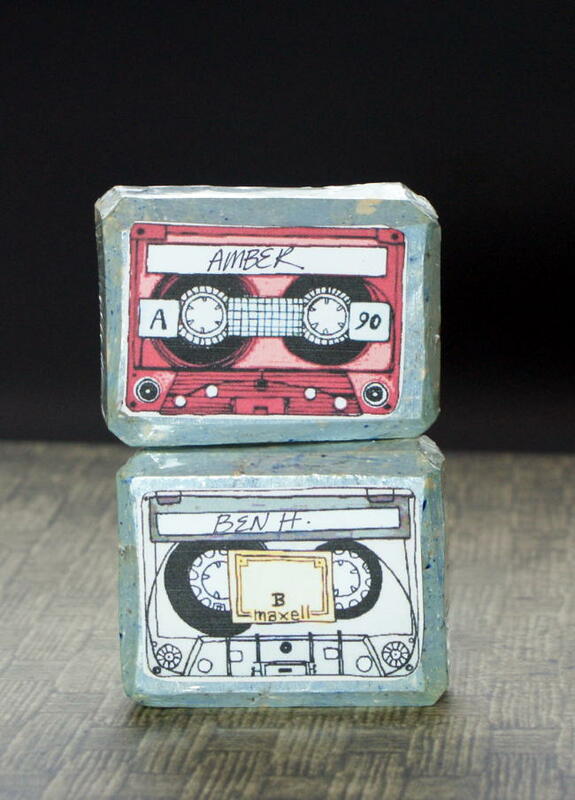 You may also find the following book titles interesting – Love is a Mix Tape: Life and Loss, One Song at a Time and Cassette from My Ex: Stories and Soundtracks of Lost Loves. 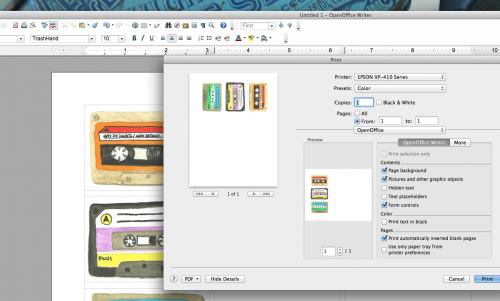 Or better yet, try this YouTube video tutorial for making your own DIY USB Cassette Mixtape. For my tutorial on making custom soap labels with text, visit my post on how to make DIY Wedding Soap Favors (with two homemade soap recipes) here. Also don’t forget about your wedding registry! When you create an Amazon Wedding Registry you’ll receive a 10% off coupon for select items across Amazon after your wedding. Plus, with Amazon’s universal registry, you can even add items to your Wedding Registry from websites anywhere on the web. Keep up with all of my new projects by following Soap Deli News blog via Blog Lovin’ and Tumblr as well as Facebook, Twitter, G+ and Instagram. Oh, those look amazing. Would make perfect Xmas stocking filler!